This week, we were greeted with a "Right! Put on all your gear, except your skates, and make your way on to the track". Here, we were asked to draw a 6 with one foot while drawing a circle with one arm. It was tricky. 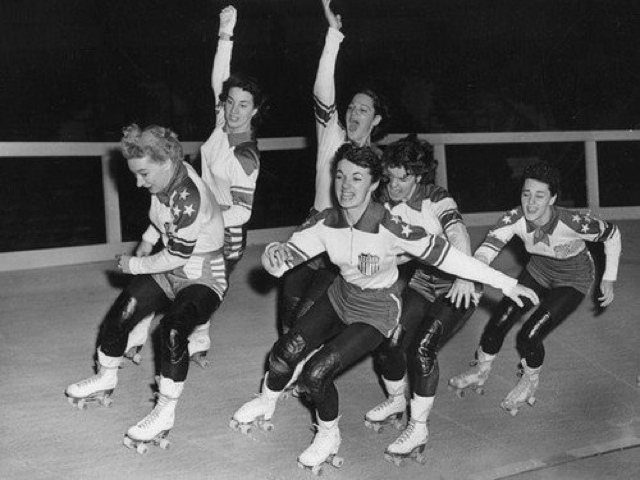 "That's what Roller Derby is like. Now go put on your skates!" An interesting start to the evening! But our coach was essentially saying that you've always got to be doing two different skills at once and it's always easier if you try and break it down. This actually made sense and that was the theme this evening took. We also had a kit check. I was told off about how thin my knee pads were but, fortunately, my new ones (Smith Scabs - Psycho) arrived this week! Yay! This week was also a change as I decided it was time to move on to the track with everyone else! There were no other newbies to head over to the other part of the rink with, so I had nothing to encourage me to go over there and I knew I had to go on the track at some point. My first fear was that there was no bar at either end as there was no end. So where, in a 10 minute warm up, I would skate to one end, stop, then skate again, stop, etc, this was 10 minutes of continuos skating. In a boiling hot skating rink. I thought I was going to die. We began the session with taps (were falls, but are now called taps with the new WFTDA rules) which I can do amazing well on my right knee now! I can go down and pop back up almost instantly. My left knee, not so much. We then moved on to stops. T-stops scared me but Plough stops encouraged me to go faster. We were told to skate as fast as we could and then try and stop. I could't stop. But I damn well tried! And I was given a "Nice! Well done!" by our coach which made me smile! The only issue I had was corners. I'd spent my last 7 weeks skating in a straight line so I was very clumsy when it came to corners, more stepping around them than skating. Especially as I can't do crossovers yet or sticky-feet! I left feeling pleased that I'd moved over on to the track and discovered it wasn't as scary as I had thought! We've been told that next week we're starting with 25 in 5. This means 25 laps of the track in 5 minutes. It sounds terrifying. Wish me luck!